The mission of Communities In Schools of the Dallas Region, Inc. is to surround students with a community of support, empowering them to stay in school and achieve in life. Of the students we worked with last year: 78% are living in poverty, 46% have limited English proficiency, 39% are reading below grade level, 30% failed statewide benchmark tests and 18% failed core level courses in the previous year. In partnership with local school districts, we provide daily school based interventions to students in grades K–12 to address academic failure, truancy, behavioral issues, social service needs and more. Your contributions play a vital role in our efforts to help students reach their full potential. Keep in touch by connecting on social media and subscribing to our email newsletter. Becoming a CISDR volunteer is a fun and rewarding way to have a positive impact on the life of a child. If you have a desire to help schoolchildren succeed, then we want to hear from you. Copyright 2019. 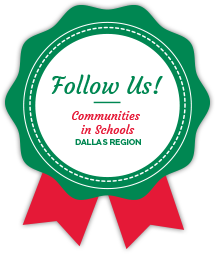 Communities In Schools of the Dallas Region, Inc. All Rights Reserved.